Cole slaw is a popular side dish for cookouts and other social gatherings, and you can find it at many restaurants as well. While many cole slaw recipes contain mayonnaise, a high-fat and high-calorie ingredient, you can use vinegar as a base to provide moisture and reduce the calorie and fat content. Thus, you may find a vinegar-based cole slaw a suitable substitution for mayonnaise-based cole slaw if you're trying to manage your weight. Nutrition can vary among recipes. Due to the lack of mayonnaise in vinegar cole slaw, the side dish is relatively low in calories. One cup of vinegar cole slaw contains 50 calories, an amount that comprises just 2.5 percent of your total calories, based on a 2,000-calorie diet. This amount is much less than a cup of mayonnaise-based cole slaw, which is 193 calories You could burn the calories in 1 cup of vinegar cole slaw by jogging for about five minutes or swimming laps for six minutes. Because vinegar cole slaw does not contain mayonnaise, it is moderately low in fat, with 4 g in each cup. Dietary fat is high in calories, so foods rich in fat tend to be calorie-dense. Dietary fat does offer benefits, as it helps your body absorb vitamins and can provide feelings of satiety. The National Academies suggest consuming a diet comprised of between 20 and 35 percent of your calories from fat. Vinegar cole slaw is low in carbohydrates. Each cup contains 8 g of carbohydrates, which are your body's primary source of energy. Consuming carbohydrate-rich foods can be particularly beneficial prior to athletic events -- and they can also fuel your daily activities. The National Academies recommends eating at least 130 g of carbohydrates each day. Vinegar cole slaw is a not a rich source of dietary fiber, as it contains 1 g per cup. This nutrient can help maintain stable blood sugar levels, a healthy digestive system and normal cholesterol levels. Dietary fiber can also promote feelings of fullness. 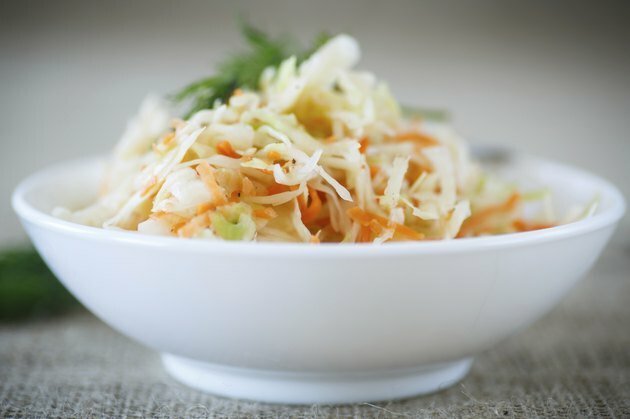 Women should consume 25 g of fiber daily, while men should consume 38 g.
Vinegar cole slaw is not a good source of protein, with just 1 g in each cup. This amount is 7 g less than a cup of milk provides. According to the National Academies, you should consume .8 g of protein for every kilogram of body weight. To find your weight in kilograms, divide your weight in pounds by 2.2. Vinegar cole slaw is moderately high in sodium, as each cup contains 138 mg. That amount comprises about 6 percent of the USDA recommendation of 2,300 mg daily. If you consume too much sodium, you may experience water retention and high blood pressure. Although vinegar cole slaw does have some nutritional drawbacks, it is rich in at least one vitamin. A cup of this food provides 27 percent of the daily suggested intake of vitamin C but just 1 percent of the daily suggested intake of vitamin A. Vinegar cole slaw also contains 2 percent of the daily suggested intake of calcium and 1 percent of the daily suggested intake of iron. What Is in KFC Cole Slaw? How Many Calories in Creamy Tomato Soup?